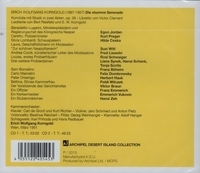 “DIE STUMME SERENADE is a German-language musical comedy by Erich Korngold to a libretto by Victor Clement. The style of the comedy is a mix of operetta and 1920's style revue songs, and is scored for a small chamber orchestra: two pianos, celesta, two violins, cello, flute, clarinet or saxophone, trumpet, and percussion. The plot is set in 1820's Naples. 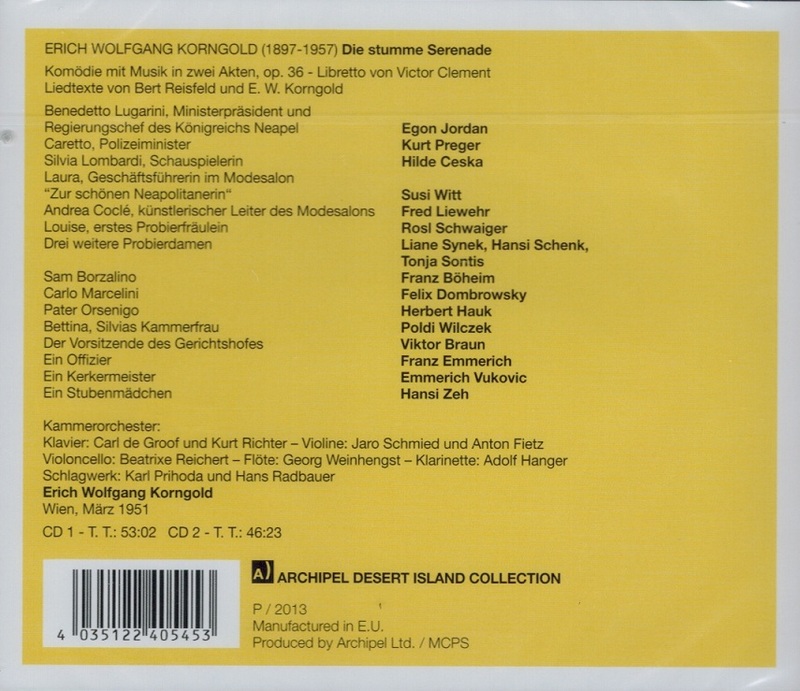 Korngold worked on the piece from 1946-1951, with a version (shortened from 180 to 100 Minutes) being premiered by Radio Vienna in 1951 [the recording, above], then the full version on stage at Theater Dortmund in 1954. Critical response was highly negative - the 1950's audience did not welcome a reinvention of 1920's Berlin cabaret. A child prodigy, Erich played his cantata GOLD to Gustav Mahler in 1906; Mahler called him a ‘musical genius’ and recommended study with composer Alexander von Zemlinsky. Richard Strauss also spoke very highly of the youth. At the age of 11 he composed his ballet DER SCHNEEMANN (The Snowman), which became a sensation when performed at the Vienna Court Opera in 1910, including a command performance for Emperor Franz Josef. This work was followed first with a piano trio, then his Piano Sonata # 2 in E major, which Artur Schnabel played throughout Europe. 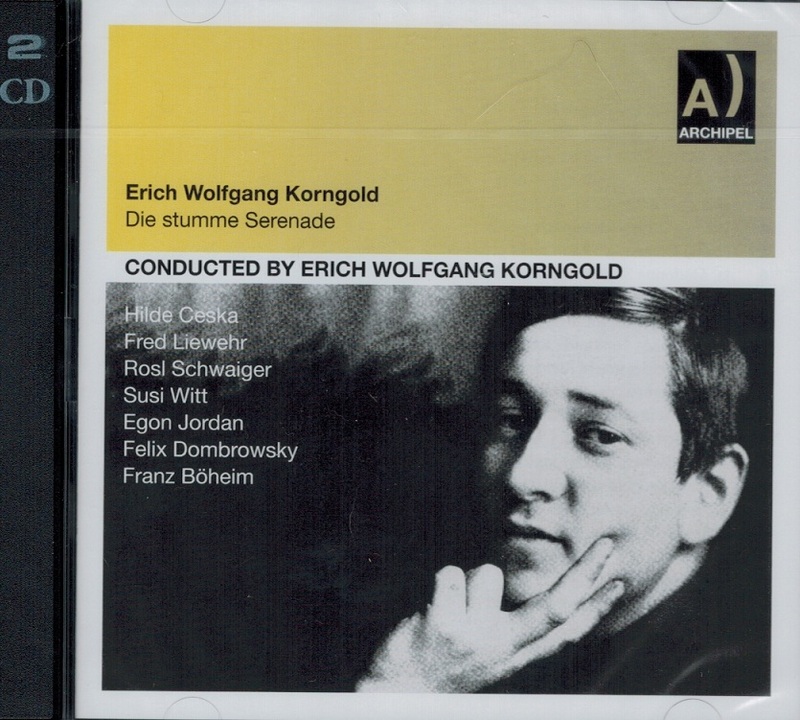 Korngold wrote his first orchestral score, the SCHAUSPIEL OUVERTURE when he was 14. His Sinfonietta appeared the following year, and his first two operas, DER RING DES POLYKRATES and VIOLANTA, in 1914. He completed his opera DIE TOTE STADT, which became an international success, in 1920 at the age of 23. At this point Korngold had reached the zenith of his fame as a composer of opera and concert music. Composers such as Richard Strauss and Giacomo Puccini heaped praise on him, and many famous conductors, soloists and singers added his works to their repertoires. He completed a Concerto for Piano Left Hand for pianist Paul Wittgenstein in 1923 and his fourth opera, DAS WUNDER DER HELIANE four years later. He also started arranging and conducting operettas by Johann Strauss II and others while teaching opera and composition at the Vienna Staatsakademie. Korngold was awarded the title professor honoris causa by the president of Austria.